ORLANDO – Even now, 20 years later for the Orlando Magic, the 1995 NBA Finals serve as both a giddy, unforgettable memory and a time that the franchise would just as soon forget because of the pain associated. By vanquishing the Indiana Pacers in Game 7 of the East Finals in ear-splitting noise at Orlando Arena, a young and talented Magic squad reached the NBA Finals in just the organization’s sixth year of existence – the second-quickest in NBA history. And with a loaded roster that included Shaquille O’Neal, Penny Hardaway, Horace Grant, Dennis Scott and Nick Anderson, the 1995 Finals seemed to be the launching point of one of the NBA’s truly dynastic runs for the decade ahead. And Magic fans that filled Orlando Arena with enthusiasm and noise were a big part of the team’s impressive run to its first NBA Finals. All around town, store fronts featured Magic logos, cars had Magic license plate covers and items such as Grant goggles, Shaq’s Superman capes and Lil’ Penny dolls were everywhere. Quite frankly, the Magic were the biggest show in all of sports – yes, at that time even bigger than Michael Jordan, someone that Orlando had whipped in the playoffs two rounds earlier. Seemingly all that awaited the team’s coronation as champions was four victories in the NBA Finals against the sixth-seeded Houston Rockets. Things couldn’t have started much better for the Magic as they weathered a shaky first half, used a 37-19 explosion in the third quarter and took an 87-80 lead into the fourth. And Orlando would stay comfortably ahead down the stretch, holding a three-point edge in the final minute. And then disaster hit as Anderson – the first player ever drafted in Magic history and still a beloved figure in Central Florida – missed four consecutive free throws. That allowed Houston to tie the game and win it 120-118 in overtime on a tip-in by Hakeem Olajuwon. It was a horrifying sequence of events that still haunts Magic players, fans and coaches to this day. Seeing a sure-fire victory slip through their fingers was devastating to all associated with the Magic. And even now, 20 years later on Sunday, June 7, the Magic wonder what could have been had Anderson been able to make just one free throw and Orlando would have won in Game 1. The Magic ultimately made it back to the NBA Finals in 2009, winning the franchise’s first Finals game before losing 4-1 to the Los Angeles Lakers. Even with that return to the Finals, it did little to take away the sting of what happened 20 years ago in 1995. Even though the Magic possessed one of the game’s most lethal inside-outside combos in O’Neal and Hardaway, were loaded with talent at every spot and had the East’s No. 1 seed by virtue of 57 wins, many thought Orlando wasn’t yet ready to compete for a title. After all, the Knicks and Pacers had far more experience and Jordan had returned from baseball to make the Bulls a contender again in the stacked Eastern Conference. But all the Magic did during their playoff run that ’95 season was close the famed Boston Garden with a defeat of the Celtics and whip the Bulls thanks in part to an iconic knock-away steal by Anderson on Jordan in Game 1. The East Final featured some dramatic emotional swings, but Orlando closed it out in a Game 7 that most still call the biggest moment in franchise history. That was also a time when legendary owner Rich DeVos uttered the phrase, ``Why not us? Why not now?’’ in reference to the Magic being good enough to defy the odds and get to the NBA Finals. As it turns out, he was right. ``We all remember the Indiana series with all of the ups and downs, all the emotion and close games and the heartbreaking loss in Game 6,’’ Pat Williams recalled. ``And now we’re coming home for Game 7 and the building was alive and wired and we jumped on them. And it was an absolute crushing. Our crowd was just loving it and it was one of the highlights of the 26 years of this franchise. An expansion franchise in 1989, the Magic drafted wisely with Anderson and Scott and got lucky in the NBA Draft lottery to get in position to take O’Neal and Hardaway. Making the Finals in just their sixth season – something only eclipsed in NBA history by the 1971 Milwaukee Bucks of Kareem Abdul-Jabbar (three seasons). In some ways that 1995 NBA Finals announced the Magic to the rest of the sports world, but fans around the globe were already very familiar with the franchise because of the enormity of O’Neal’s game and persona. The defending champion Rockets limped into the playoffs at 47-35, but they beat Utah in the first round and rallied from a 3-1 deficit to knock off Charles Barkley and the Phoenix Suns in the second round of the playoffs. And even though Houston crushed San Antonio 4-2 in the West Finals, many experts had the Magic as the favorites to win the Finals. And for most of Game 1, it looked as if the athletic and powerful Magic would make quick work of the aging Rockets. At one point in the lopsided third quarter of Game 1, as the Magic seemed to be pulling away, Pat Williams remembers being struck by one distinct thought. It’s been 20 years, but any Magic fan with gray in their hair and memories of the O-rena can still close their eyes and recall the horrifying sequence that took place at the end of Game 1. With Orlando up three and Houston forced to foul, they hacked Anderson and sent him to the stripe. For the Magic, that seemed to be a very good thing as Anderson made 70.4 percent of his free throw attempts during the regular season and he had hit 40 of 53 tries (75.4 percent) in the three rounds of the playoffs before the Finals. First free throw: Well short, causing Anderson to angrily spin away in frustration. Second free throw: Short again, causing the carom to bounce all the way back to Anderson at the free throw line where he was once again fouled. Sadly, the horrifying sequence didn’t end there for the Magic and Anderson. Third free throw: Determined not to leave another shot short, Anderson’s try goes long and hits off the back iron. Fourth free throw: The final one was closer, but it still hit off the back iron and then the front rim before falling off. ``The reaction of Nick Anderson (frustratingly looking upward) is obvious because he’s knowing that if he had just made one of those it would have given the Magic a hammer-lock on this game,’’ former coach Matt Goukas said as an analyst on NBC at the time. Houston guard Kenny Smith, now of TNT analyst fame, drilled what was a then NBA-record seventh 3-pointer to tie the game. Reeling from what had happened, Orlando fell down by three before Dennis Scott forced OT with a 3-pointer. But the Magic’s hopes would be crushed again when O’Neal and Grant came over to contest a Clyde Drexler layup attempt and Hakeem Olajuwon tipped in the game-winner. Even though O’Neal, head coach Brian Hill and others tried to comfort Anderson in the losing locker room afterward, the free throw misses at the end of regulation haunted the talented shooting guard. 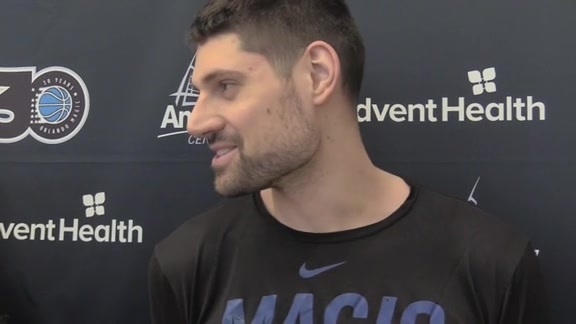 Anderson, who along with Pat Williams was the first inductees into the Magic Hall of Fame and he works now as a Community Ambassador for the team, admitted years back that it was difficult to live with the memory of what happened in Game 1. Houston, of course, went on wipe out another big deficit in Game 2 and totally crush the Magic’s spirits. Games 3 and 4 in Texas were close, but the Rockets still found a way to win as Olajuwon rolled to the NBA Finals MVP award. Houston became the first team in NBA history to win a title despite not having home-court advantage in any round of the playoffs. Next week, NBA TV Originals is unveiling a documentary called Clutch City that celebrates the 20-year anniversary of Houston winning back-to-back titles. Forgive those with Magic ties if they aren’t a bit envious that the documentary isn’t about the beginning of several titles in Orlando. Some of the Magic’s bitterness at the time was tempered by the fact that the young and hungry team figured that 1995 was the first of many Finals runs. After all, O’Neal was 24 years old, Hardaway was 23 and the rest of the core remained in place. But the championship dreams – as the case was with many NBA teams’ aspirations – died at the hands of Michael Jordan, who led the Bulls to 72 wins in 2006 and an Eastern Conference sweep of the Magic. Several weeks later, O’Neal announced his departure for the Lakers and Orlando’s dynamic roster came unglued. Following that breakup, the franchise would go 12 years without winning another playoff series. The 2009 return to the NBA Finals showed the resolve of the Magic, but it still couldn’t take away the sting of the double-whammy from 1995 and ’96. ``I actually felt that we went to the NBA Finals a year early (in 1995), to be honest with you. The following year I thought we would be a legitimate contender and we were, but unfortunately we had to beat Chicago which had just had the best season in NBA history with 72 wins,’’ said Brian Hill, whose 1996 squad won 60 games despite O’Neal missing a third of the season with a thumb injury. ``Michael Jordan, after losing to us the year before, there’s no way he was going to allow that (1996) Bulls team to not win a NBA championship. O’Neal went on to win four titles with the Lakers and Heat and Horace Grant also won four times with the Bulls and Lakers. However, both grow noticeably frustrated when the talk turns to the title that got away from them 20 years ago in 1995.